Christmas Exchange ornament from Su! After my walk with Max this morning, I returned home and started my breakfast and five minutes later the parcel van turned up (we now have a nodding relationship, the poor guy stops by our place at least once a week these days) and today’s parcel was from Su (susimac) and it contained the Christmas Ornament Exchange piece Su had stitched for me. Many thanks Su, I absolutely love it! Su stitched a design by Jean Farrish Needleworks from the 1998 issue of Just Cross Stitch Christmas Ornaments (it may still be a freebie on Jean Farrish’s website, it was earlier this year). It’s gorgeous!! It has been on my list of ornies to do for ever but I have never got around to it. Su did a wonderful job on it, it is just lovely. In her card Su said she has done this ornie 3 times!! But that is not all Su sent. 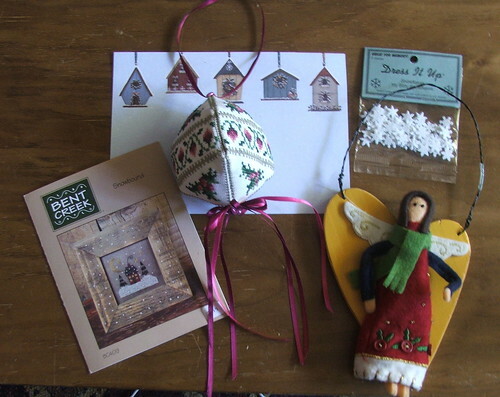 She sent an adorable angel heart ornament, a wonderful chart by Bent Cre ek (and would you believe I have all the materials to make a start on it? Amazing) and some cute little snowflake buttons in addition to her card. Many Thanks Su, it was a wonderful package to receive and as you can all see it is already on my tree. I have also had word that Katrina received her package from me, an update tomorrow will show the ornie I stitched for this exchange. Feels a lot like Christmas around here now. My goodness, Su made such a unique ornie! What a wonderful gift. What a fabulous exchange to receive! You must be walking on air!! You lucky person! I just love Su’s ornament. I did find it on Jean Farish’s website, and now I’ll have to do it myself. That is a great ornament Su stitched for you and I like the one you stitched (in your previous post) too! 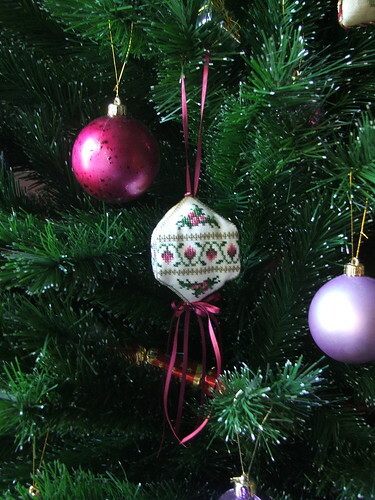 I always love the ornaments everyone else does and wish I had more time to stitch them all! Su stitched a gorgeous ornament!